If you want a hardgainer diet to gain weight fast you need to be eating the right foods and balance of nutrients to gain weight. “Hardgainers” are guys who want to get big but no matter what they try, gaining weight and size fast doesn’t come easy. For many hardgainers a fast metabolism gives them a naturally lean and wiry physique and stops them from gaining weight. However even guys with fast metabolism’s can gain weight and build big muscle, just by following these top 3 food and diet principles for gaining weight fast. 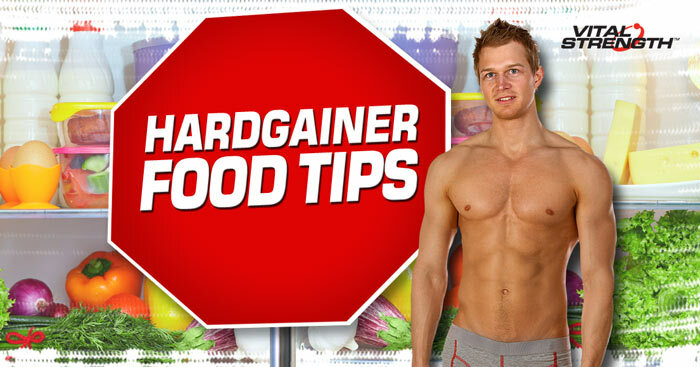 Eating foods according to these key principles for the best hardgainer diet will help you gain weight quickly and move from scrawny to BIG! Simply put, calories are the energy (kJ/Cals) that we get from foods in our diet and are essential for gaining weight. To gain weight and build muscle size a hardgainer’s calorie intake needs to be greater than the energy used. If you are a hardgainer with a fast metabolism you need to be over-feeding your muscles and consuming more calories in your diet than the average guy if you want muscle mass and weight gains. Hardgainers note: This does not mean loading your hardgainer diet with processed or junk foods. When you goal is to gain weight and muscle size your calorie intake should be provided by a combination of protein, carbohydrates and good fats. Many people ask, how many calories is best for gaining weight in a hardgainer diet? As a guide we advise that hardgainers eat between 40-50Cal/kg per day. Using this hardgainer calorie counter, if you are a hardgainer and weigh 80kg, your caloric intake will be 3200-4000Cal per day (i.e 80kg x 50Cal). The best hardgainer diet to gain weight fast will consist of around 50% carbs, 25 % proteins and 25% good fats. Vitalstrength Extreme Rapid Protein contains 50% carbohydrates and 42% protein, making it an ideal food for gaining weight fast. As well as the optimum nutritional content the amino acid profile of Vitalstrength Rapid is particularly suited to gaining weight and building muscle mass with added glutamine and creatine to help minimise muscle breakdown and increase size gains. Hardgainer’s wanting to gain weight and put on size need to be eating 6 meals per day + and eating at least every 2-3hrs (if not more). The best hardgainer diet for gaining weight will include 3 solid main meals along with 3-4 macronutrient rich snack meals throughout the day. For best weight gain results, a hardgainer’s first meal should come as soon as you wake up in the morning and your last meal should be just before you go to bed. Remember, during the time you sleep, your muscles are essentially starving. So feed them. 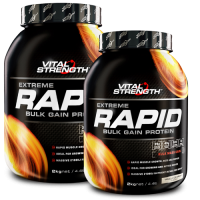 Vitalstrength Extreme Rapid Protein is one of Australia’s most popular hardgainer proteins to help you gain weight fast plus VS Rapid is great to have for breakfast and in between meals. Vitalstrength Extreme Rapid Protein contains mass protein, simple/complex carbohydrates and muscle protectors providing you an easy calorie packed meal option. Mix with milk and add oats to further increase the calorie density. Post-workout is another essential time for hardgainers to feed your muscles. In order to gain weight fast and increase muscle bulk hardgainers should consume a meal or protein shake within 30minutes of training consisting of carbohydrates and protein. Vitalstrength Extreme Rapid Protein is an ideal post workout shake for a hardgainer. To ensure your size gains are maintained and your efforts are never wasted, Vitalstrength Rapid also contains key micronutrients for muscle growth and repair. Always remember that even some of the big guys at the gym were hardgainers once too! And finally, remember if you want to GET BIG, you need to EAT BIG everyday!